People’s Sculpture Racing (PSR) currently stages two annual races and exhibitions. THE PEOPLE’S SCULPTURE RACE, a juried race that takes place at the Cambridge Arts River Festival each June. Design proposal applications are due Sunday, March 24 at midnight (new date). COMMUNITY SCULPTURE RACE. Each April during the Cambridge Science Festival. This is an unjuried race; applications are due at the last minute in April. Sculpture races are short races (< 1 mile) of pushed, pulled, and pedalled artwork in urban locations followed by exhibitions. People’s Sculpture Racing (PSR) currently stages two annual races and exhibitions. Everyone is invited to submit applications for and participate in both races, with the caveat that jurors must approve River Festival teams, and all must follow the basic guidelines. In past years, families who initially participated in the Community Race entered and contended in the River Festival. Likewise, River Festival racers have participated in the Community Race. Please see the following call for entries details, and guidelines. Also, be sure to look at images from the World Sculpture Racing Society, and past PSR races for ideas. Click here for information on entering the juried June 1 People’s Sculpture Race. NEW deadline for entries is Sunday, March 24, midnight. Click here for information on entering the April 20 Community Sculpture Race (updated link). Final deadline is RACEDAY – April 20 to let us know you’re racing. Q: Two Events: Community Sculpture Race & River Festival Race–what’s the difference? The People’s Sculpture Race & Exhibition at the Cambridge Arts River Festival, usually the first Saturday in June, rain or shine, is a ¾ mile juried race of pushed, pulled, or pedaled sculpture with a following daylong exhibition at the Cambridge Arts River Festival. The festival is an annual celebration with 150,000–200,000 festival-goers. Participants have the opportunity to join in a spectacular, well-attended event, and exhibit their work publicly on Race Day and on the PSR site. Entries are due in early March. 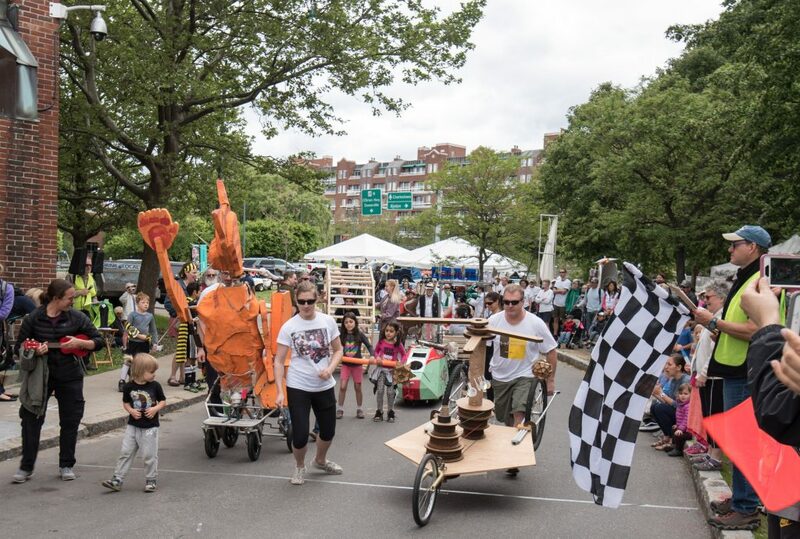 The Community Sculpture Race & Exhibition at Danehy Park, usually the third Saturday in April, is a ½-mile unjuried race and exhibition of wheeled kinetic sculptures in northwest Cambridge (near Fresh Pond Mall) open to all. We welcome racing sculptures for the race and drawings & prototypes for the exhibition. This is a Cambridge Science Festival event. (Rocket Day takes place next to the racecourse & exhibition. We will also participate in the Festival’s Science Carnival & Robot Zoo on the second Saturday in April. Q. How do I submit proposals for each event individually? A. 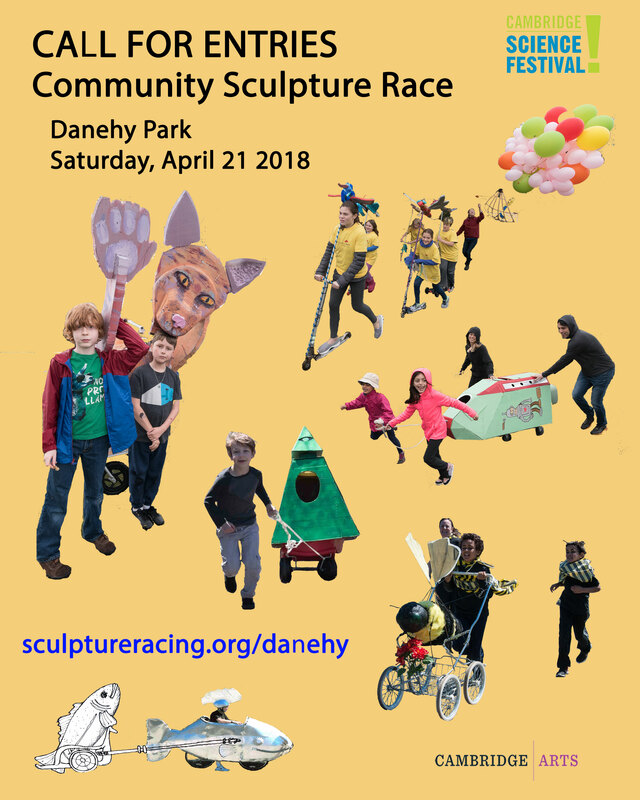 For the Community Sculpture Race at Danehy Park: if you plan to race, please submit your entry by the date above to sculptureracing@gmail.com. For the Exhibition, let us know as soon as you can so we can send you instructions or just show up on the day of the event. A. For The Cambridge Arts River Festival Race, you should submit your entry by the date above to sculptureracing@gmail.com. Please see the call for entries for details. We will let you know within a week whether your proposal has been accepted. Then get to work building it! A. River Festival: Anyone or group of people may submit a proposal, and may join the race if the proposal is approved. A. Community Race: Anyone may submit a proposal, and may join the race as long as guidelines are followed. Often a whole family will design, build, and race together. Q: What is the difference between People’s Sculpture Racing (PSR) and the nationally popular Kinetic Sculpture Racing (KSR) genre? A: PSR racing sculptures, like those of its originator, World Sculpture Racing, favor art, encourage kinetic work, and are predominately pushed and pulled, and performatively raced along short, flat urban courses. KSR vehicles are all pedaled, and have a stronger engineering focus, because they traverse difficult terrains or obstacles. Q: I have two left feet. May my friends and extended family race my sculpture? Q: I have an old racing sculpture in the loft of my sister-in-law’s barn. It was shown at the Venice Biennale in ’97. Do entries have to be made new and never-before-shown for this event? A: Take out your oil can! That said, in the case of a work having raced recently, jurors *may* give more weight to new works at their discretion. Q. I heard there was a ‘cash purse’ in 2017. Is there any hope of funding this year? A. The New England Foundation for the Arts gave PSR a grant for 2017, part of which was shared equally between teams in the River Festival Race, and part for designers and expenses. That was a one-time grant. Traditionally and looking forward, all activities of staff, artists, and jurors are voluntary. Q. May I ask a question that isn’t answered on your website? A. Please feel free to send your questions (and suggestions for the website) to sculptureracing@gmail.com.